Athens, Greece is a popular tourist destination with a lot to offer to its visitors. 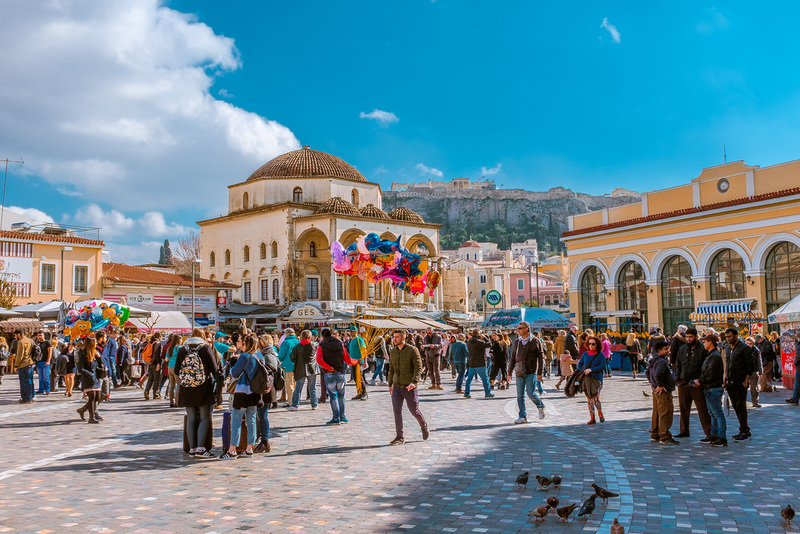 Even though Athens isn’t the largest European capital, there are still a lot to see and do and choosing where to go and how, can be confusing. On this article you can find directions to our choice of 20 popular places to visit in Athens. Along with information about how to get there by public transport, you can find more directions through Google Maps by clicking the orange links, as well as more information about each place (opening hours, admission etc.) on their official website, when that is available. So, dress comfortably and join us for a tour of Athens! 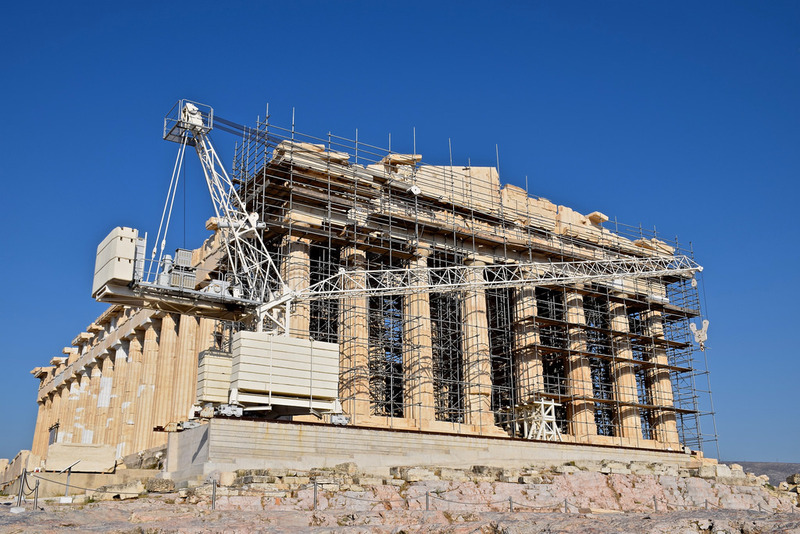 The Acropolis of Athens and the nearby New Acropolis Museum are the places every visitor to the city should go to. Sitting on top of the Acropolis hill and dedicated to goddess Athens is the temple of Parthenon. Not only a symbol for the city, but for the whole Greek civilization as well. The New Acropolis Museum opened its doors in 2009. Findings from the Acropolis, including sculptures from the Parthenon are exhibited in a modern space designed by architect Bernard Tschumi. Theater of Dionysus: Just under the Acropolis, the Theater of Dionisus was the place where Greek tragedy was born and where ancient Athens’ biggest theatrical celebration, the Dionysia took place. Further restoration of the site is expected in the future. Odeon of Herodes Atticus: The well-preserved amphitheater was built during the Roman era and today it hosts music concerts and other art performances every summer during the Athens – Epidaurus Festival. ‘Akropoli‘ Metro station on the red line (line 2) is just outside the Acropolis Museum. 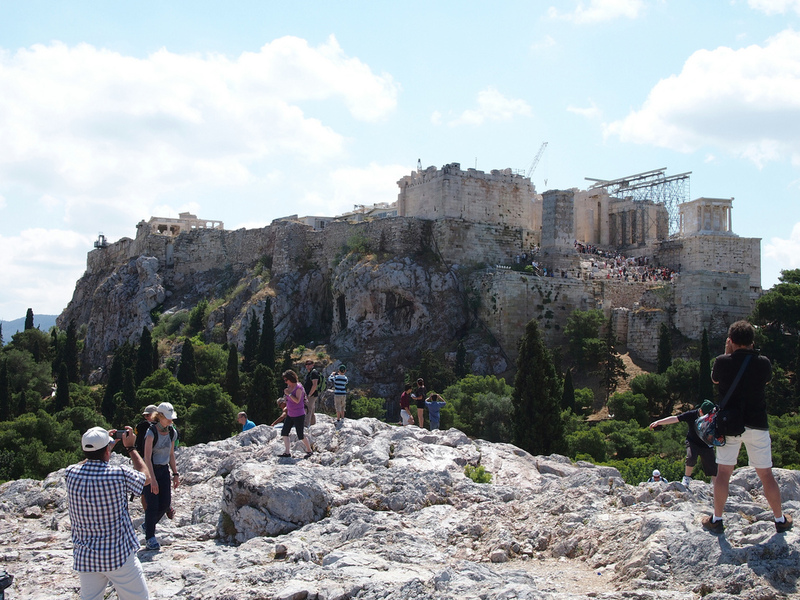 From there, you can visit the Acropolis after a 10-15 minute walk. The site is also close to the central Syntagma square (about 15 minutes walk) and Plaka (5-10 minutes walk). You can also get to Acropolis by bus line 230 which connects to Syntagma and Panepistimio metro stations. Also ‘Makrigiani’ bus stop of lines 1, 5, 040, 230, A2, A3, B2 is a 10-minute walk away. From Piraeus, express bus line X80 connects to the Acropolis (only tourist tickets and 5-day tickets are accepted). The Ancient Agora of Athens is the best-known example of an ancient Greek agora and is situated to the northwest of Acropolis. 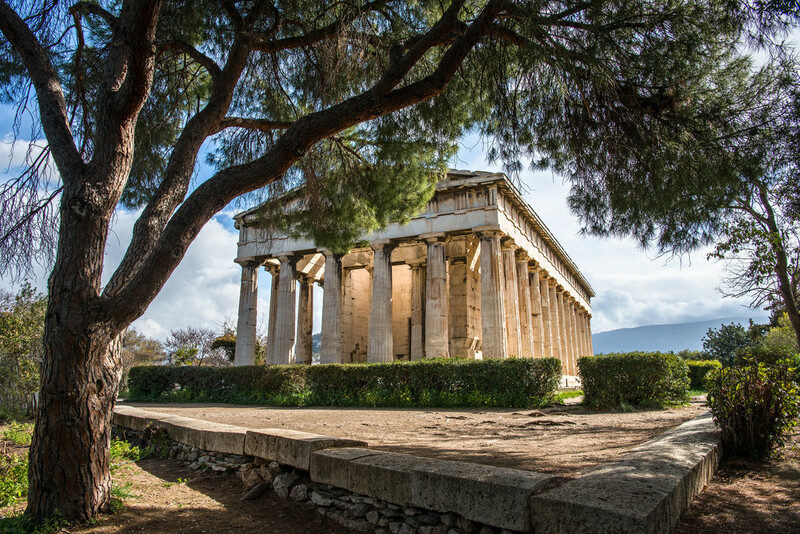 The Temple of Hephaestus, dedicated to the ancient Greek god of blacksmiths, fire and volcanoes can be found inside the site of Ancient Agora. It is one of the few Greek temples to be almost entirely preserved. 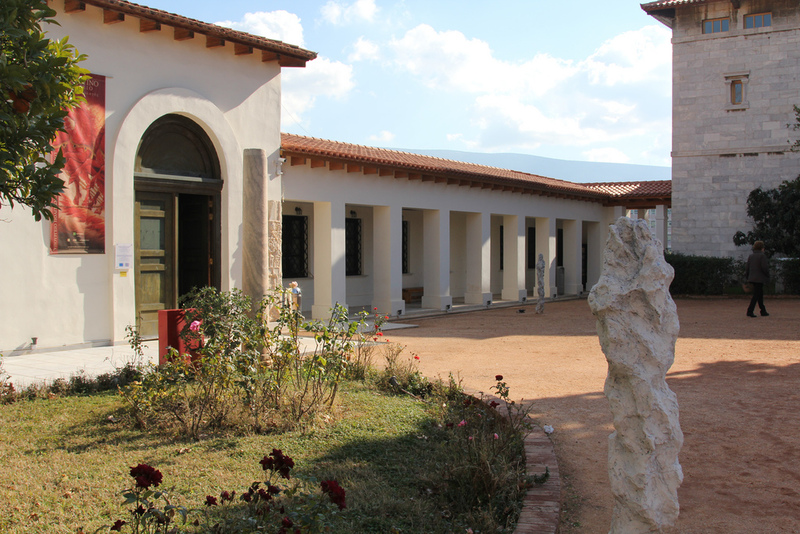 Stoa of Attalos: Built by King Attalos of Pergamon during the Hellinistic era and reconstructed by American archaeologists during the 1950’s, the picturesque building today houses the museum of Ancient Agora. ‘Thiseio’ Metro station on the Green line (line 1) is situated just next to the site of the Agora. 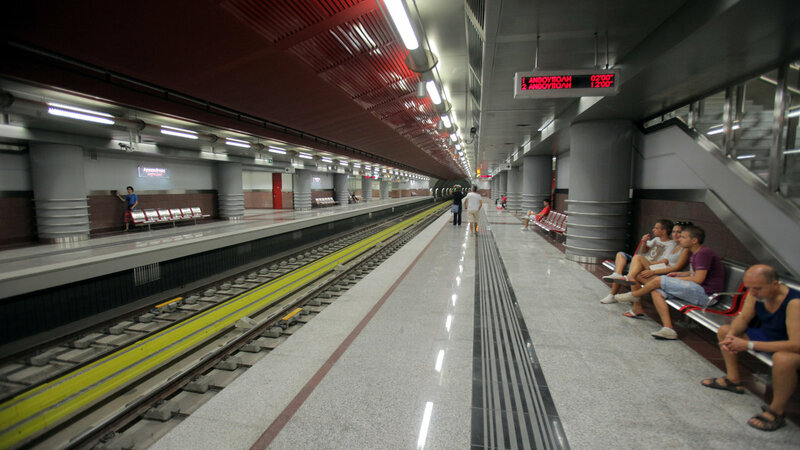 ‘Monastiraki’ station of the green and blue lines (1 & 3) is a 5 minute walk from the Agora. 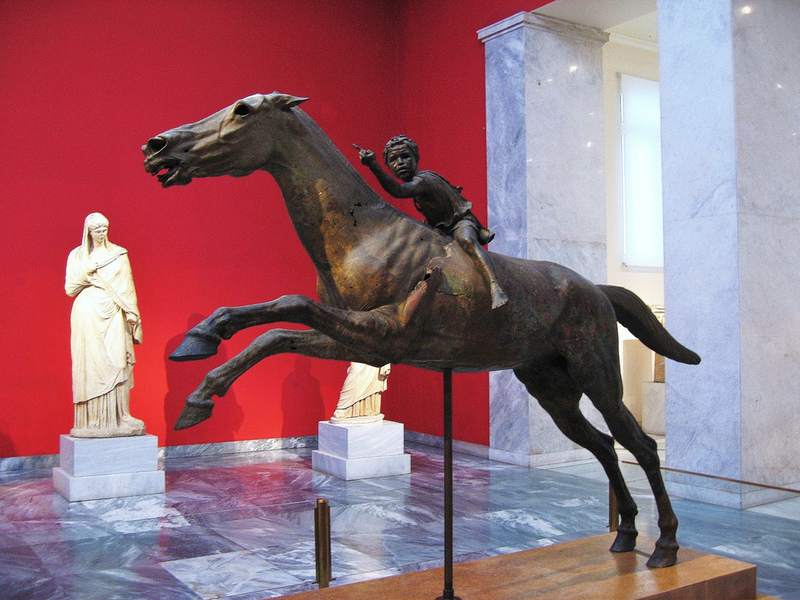 The National Archaeological Museum of Athens is one of the most important archaeological museums in the world, with artifacts from all over Greece. Among them the Artemision Bronze statue of a Greek god and the Antikythera mechanism, the oldest analog computer ever found. The museum is a 10-minute walk from Victoria station of the green line (1) or a 10-15 minute walk from Omonoia station of the green and red lines (1 and 2). A large number of bus and trolley-bus lines stop in front or close to the museum. To find more, click on the orange link. The top of Lycabettus Hill is the highest point of central Athens. From there, you can have the best view of the city, including the Acropolis and see as far as Piraeus and the Saronic gulf. You can hike to the top via a number of paths around the hill or get up there fast via the funicular (cable car) railway that travels up and down at least every 30′ or less when there is demand (Athens transport tickets not accepted). The finicular railway station (see orange link) is a 15-minute walk from Evangelismos metro station of the blue line (3). It’s an uphill route that includes stairs so it might take longer for some. Benaki Museum dates back to 1930 and hosts an important collection of Greek art from the prehistorical to the modern times, an extensive collection of Asian art while it also hosts periodic exhibitions of Greek and international artists. 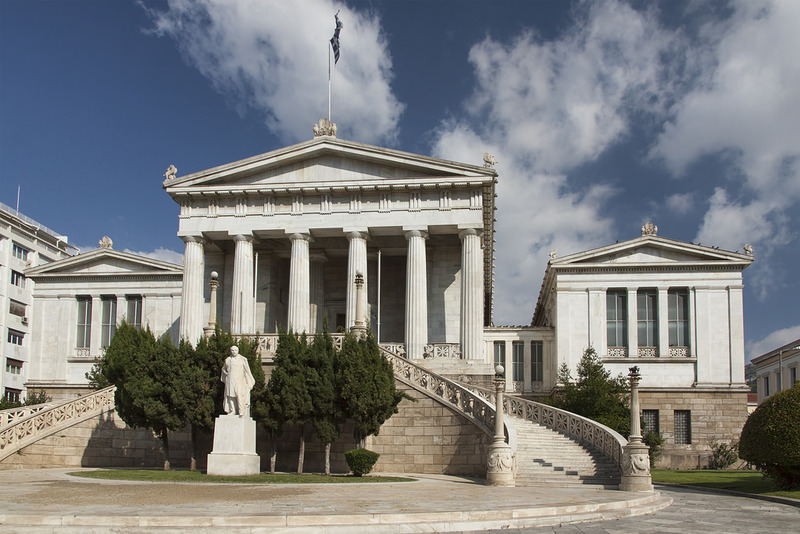 The museum is only a 5-minute walk away from Syntagma metro station of the blue line (3). More than 12 bus lines make a stop close by. Click on the orange link for specific directions. 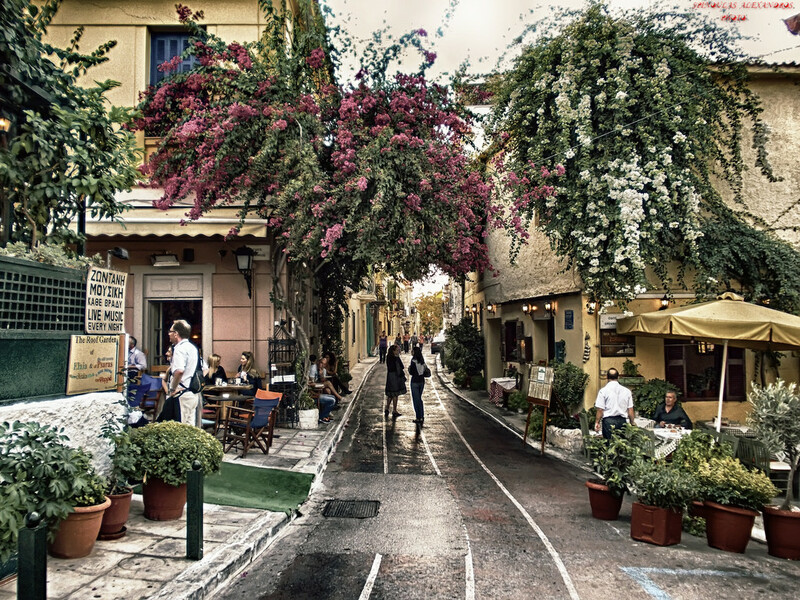 Just under the Acropolis, the neighborhood of Plaka gives visitors a taste of ‘old Athens’. It is the ideal place to take a walk or enjoy the local cafes and restaurants. The Anafiotika area, built according to typical Cycladic architecture, makes you feel like you’re on an Aegean island, away from the center of Athens. The neighborhood of Plaka is between Monastiraki and Syntagma, and a 5-minute walk from Syntagma Metro station of the red and blue lines (2 & 3), Akropoli station of the red line (2) and Monastiraki station of the green and blue lines (1 & 3). These are the 3 neoclassical buildings on Panepistimiou street, designed and built in the 19th century by Danish architect Theophil Hansen. From left to right, it’s the National Library, University of Athens and the Academy of Athens. The three buildings are just outside Panepistimio Metro station of the red line (2). A number of bus lines passes by from the area as well. 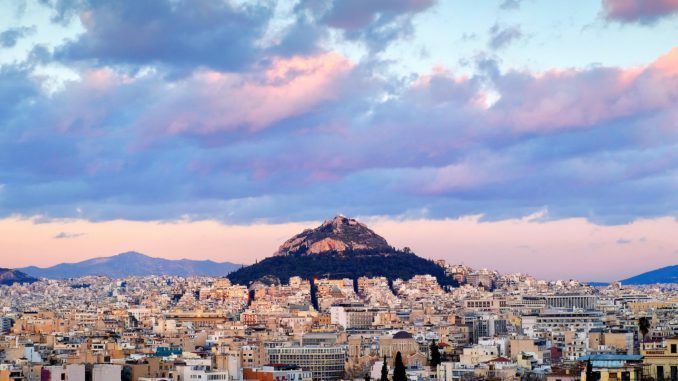 It is just a 10-minute walk from Syntagma square. The Panathenaic stadium was built around 330 BC and it was where ancient Athens’ Panathenaic Games were celebrated. After being left abandoned for centuries, it was refurbished in late 19th century using Penteli marble, the same as the one used on the Acropolis. It hosted the first Olympic Games of the modern era as well as the first marathon race in 1896. The closest Metro stations are Akropoli of the red line (2) and Syntagma of the red and blue lines (2 & 3). They’re both a 10-minute walk from the stadium. In Athens, all roads lead to Syntagma square. 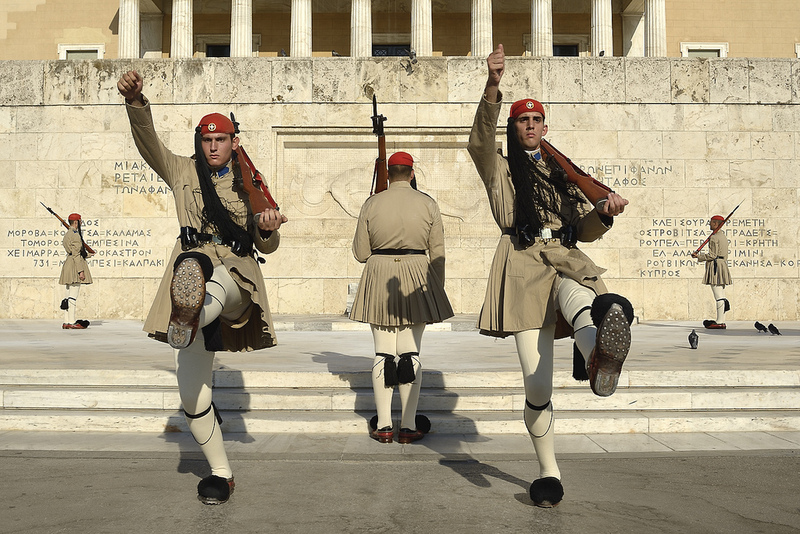 Start by visiting the Tomb of the Unknown Soldier in front of the Parliament building (former palace), guarded by the elite Evzones soldiers. The changing of the guards takes place every hour while every Sunday at 11 am there’s a more elaborate ceremony. Ermou street which begins from Syntagma is Athens’ main pedestrian shopping street. It’s also worth checking out the first level of Syntagma Metro station. Archaeological findings from the station’s excavation are exhibited around the floor. The blue line of Athens Metro (3) can bring you to Syntagma from the airport. 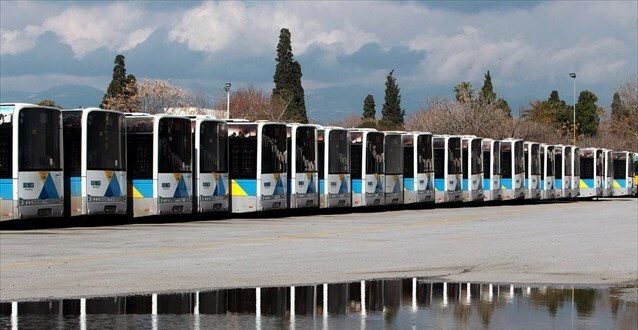 Bus line X93 travels from the Airport to Syntagma and runs 24-hours a day. 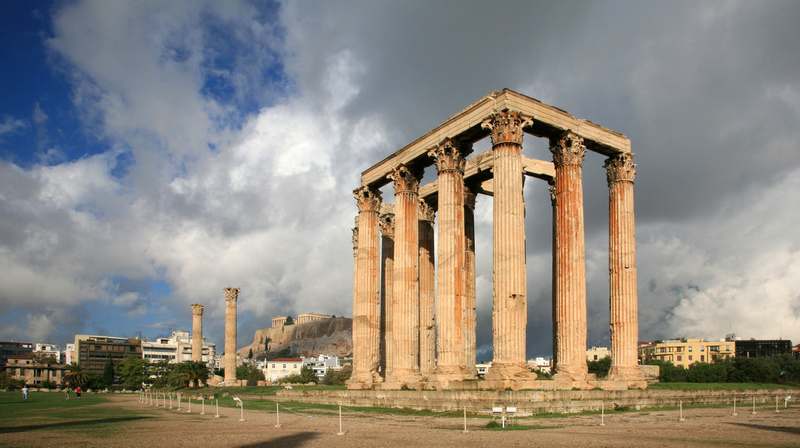 The Temple of Olympian Zeus, right in the center of Athens, used to be the largest temple in Greece during the Roman times but today only a few columns remain standing. A few meters away, stands the Arch of Hadrian, a monumental arch built during the Roman era. The Temple of Olympian Zeus is a 5-minute walk from Syntagma station of Metro’s red and blue lines (2 & 3), as well as a 5-minute walk from Akropoli station of the red line (2). A number of bus lines stop near the area. Click the orange link for more details. Designed by architect Renzo Piano and built by the Stavros Niarchos Foundation which donated to the Greek state, the Stavros Niarchos Foundation Cultural Center will become the new home of the National Opera and the National Library from autumn 2017. Built in Kalithea neighborhood, next to Faliro bay, the complex also includes the the 210,000 sq. m. Stavros Niarchos Park. Bus line B2 connects SNFCC to Syngrou-Fix Metro Station of the red line (2) as well as Syntagma station of the red and blue lines (2 & 3) and Panepistimio station of the red line (2). Bus line 550 connects SNFCC to Syngrou-Fix Metro Station of the red line (2) and Evangelismos station of the blue line (2). 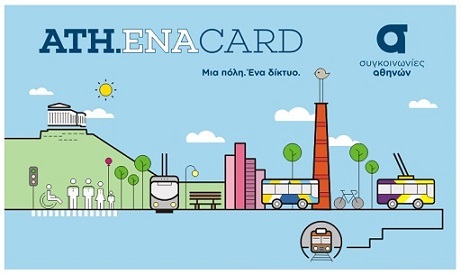 Bus line X80 connects SNFCC to the port of Piraeus, Acropolis Museum and Syntagma square (only tourist and 5-day tickets accepted). Keramikos (also spelled Kerameikos), on the banks of Eridanos river, used to be the ancient cemetery of of Athens, as well as the pottery quarters of the site, from which the word ‘ceramic’ derives. A sometimes overlooked site with rich findings from thousands of years ago. Keramikos Metro station of the blue line (3) is a 5-minute walk from the archaeological site. Thisio Metro station of the green line (1) is a 5-minute walk as well while Monastiraki station is a 15-minute walk away. The National Garden which used to be the ‘Royal Garden’ is just next to the Greek Parliament at Syntagma square (which also used to be the Royal Palace). With a size of 38 acres, it’s one of the largest green spaces in the center of the city. Zappeion Hall which is adjacent to the National Garden, is a conference and exhibition hall which opened in 1888. To this day it is often used for state and private meetings and ceremonies. The National Garden’s main entrance is next to the Parliament and Syntagma Metro station of the red and blue lines (2 & 3). Use the National Garden exit. 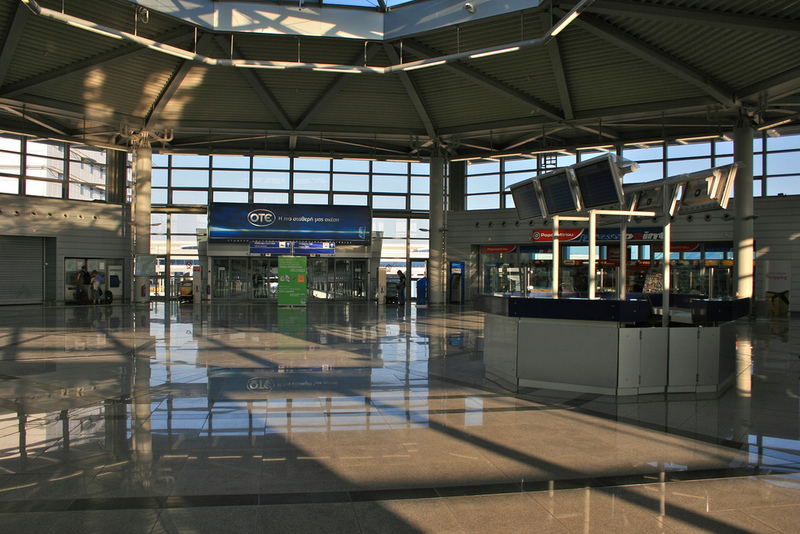 It is also a 5-10 minute walk from Akropoli station of the red line (2). 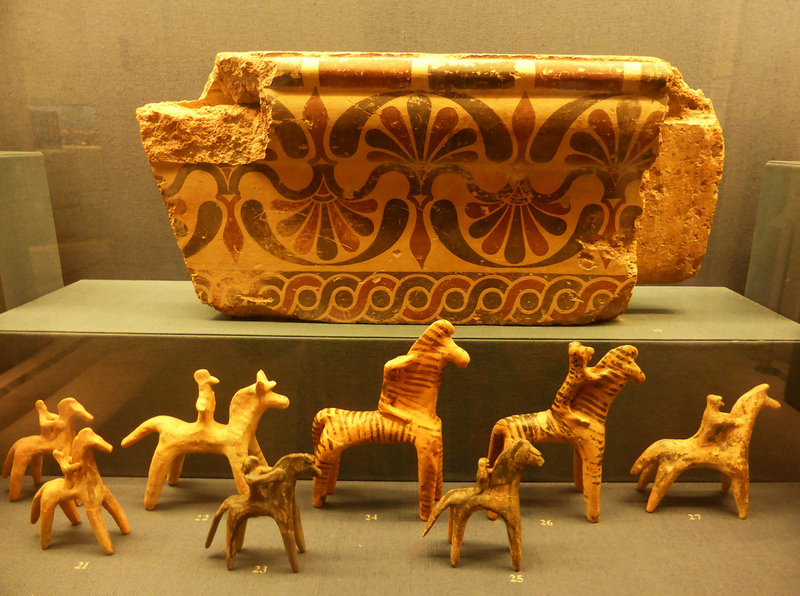 The Museum of Cycladic Art houses the Cycladic and Ancient Greek art collection of Nicholas and Dolly Goulandris. One of its two wings is houses on the neoclassical Stathatos mansion. 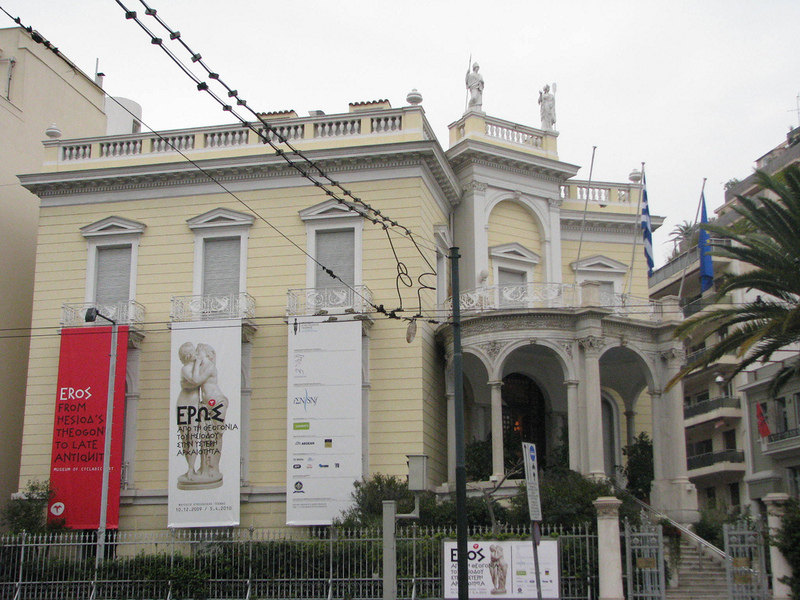 The museum is a 5-10 minute walk away from Syntagma Metro station of the red and blue lines (2 & 3). A number of bus lines pass outside the museum. For more information click on the orange link. Monastiraki flea market in the center of Athens is visited by both locals and tourists. It is the place to go for souvenirs and bargain shopping. Monastiraki station of the green and blue lines (1 & 3) is right at Monastiraki square. The location is a 10-15 minute walk from Syntagma via Ermou or Mitropoleos st. The Byzantine and Christian Museum was founded in 1914 and it houses more than 25,000 exhibits including collections of pictures, scriptures, frescoes from the early Christian years until the late medieval era. It is one of the most important Byzantine art museums in the world. 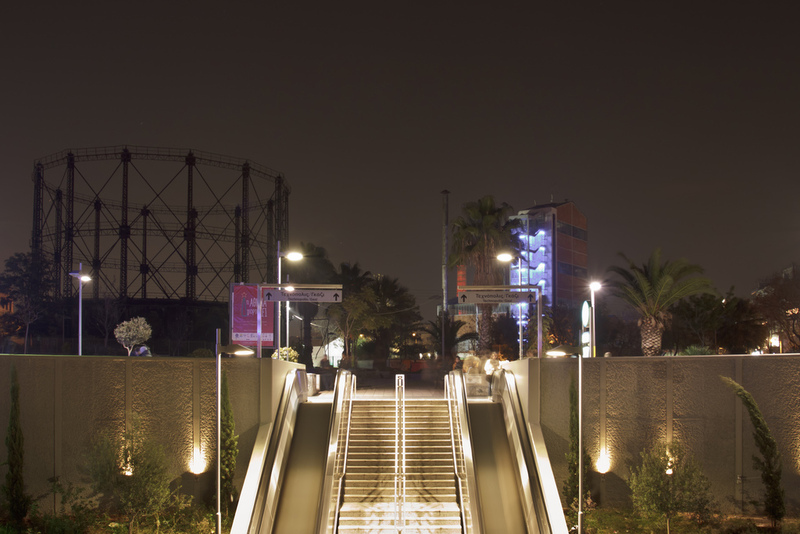 The museum is a 5-minute walk from Enangelismos Metro station of the blue line (3). Many bus lines go through the area as well (see orange link). In ancient Athens, Areopagus Hill opposite to the Acropolis used to be the homicide court of Athens. 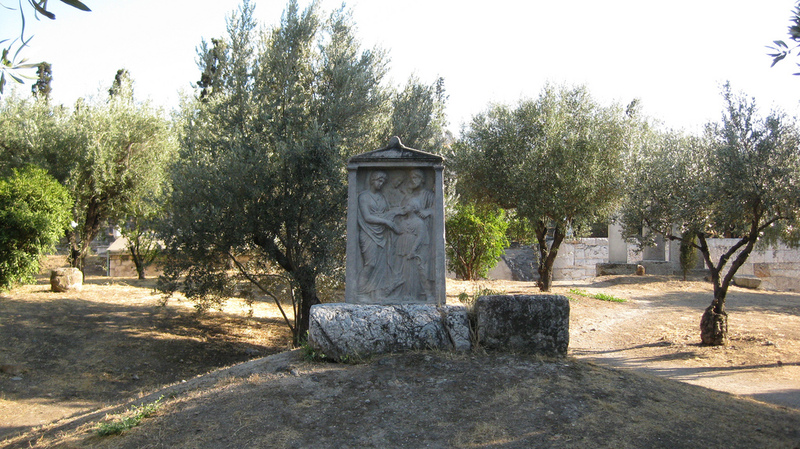 According to tradition, it is also where Apostle John gave a speech to the Athenians. Today, it is popular with travelers as it offers a magnificent view of the Acropolis, the ancient Agora, and the sunset. Don’t forget to wear appropriate shoes as the hill is slippery. 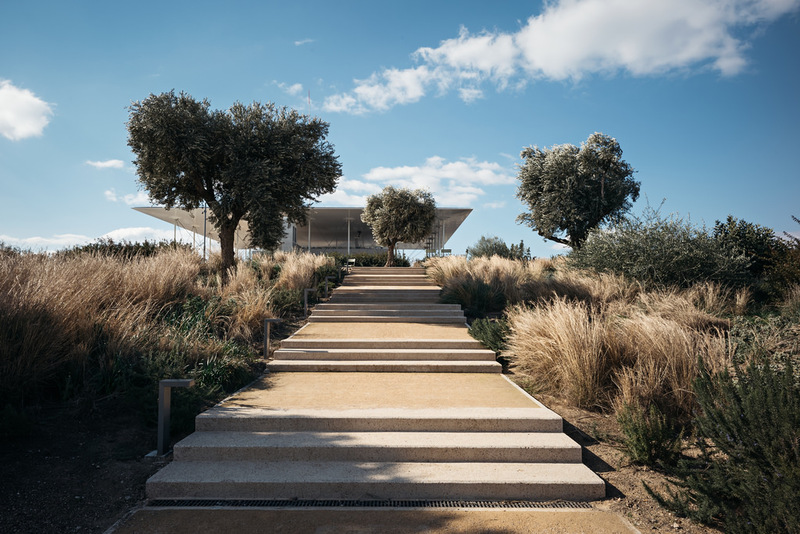 The hill is a 10-minute walk from Akropoli Metro station of the red line (2). It is accessible through a pathway connected to the entrance of the Acropolis. 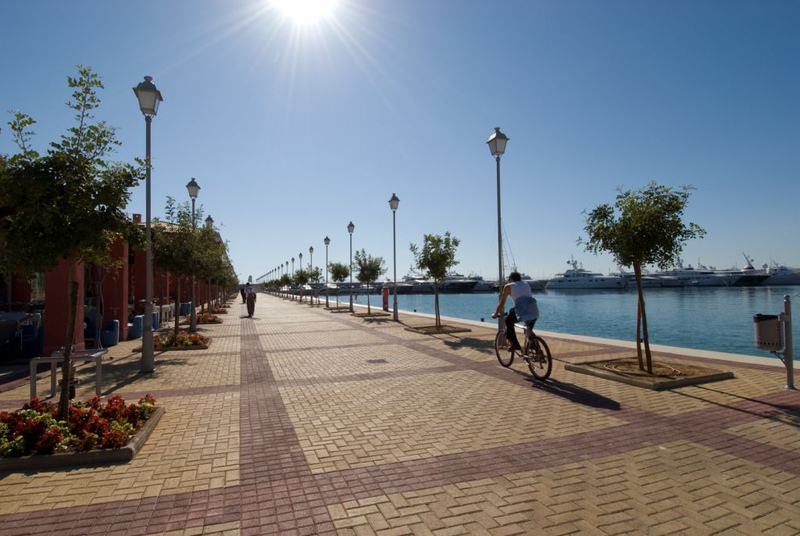 Flisvos Marina has been transformed into an entertainment destination with many locals visiting to enjoy a walk, cycling, or to have a coffee or meal. 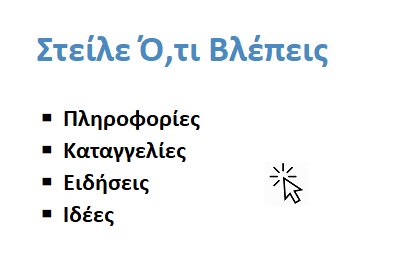 From Syntagma or Panepistimio Metro stations: Take bus line B2. From Syngrou-Fix Metro station: Take bus line B2 or 550. Get off at ‘Oulen’ bus stop. From Neos Kosmos Metro station of the red line (2): Take the Tram towards SEF. Get off at Trokadero stop. 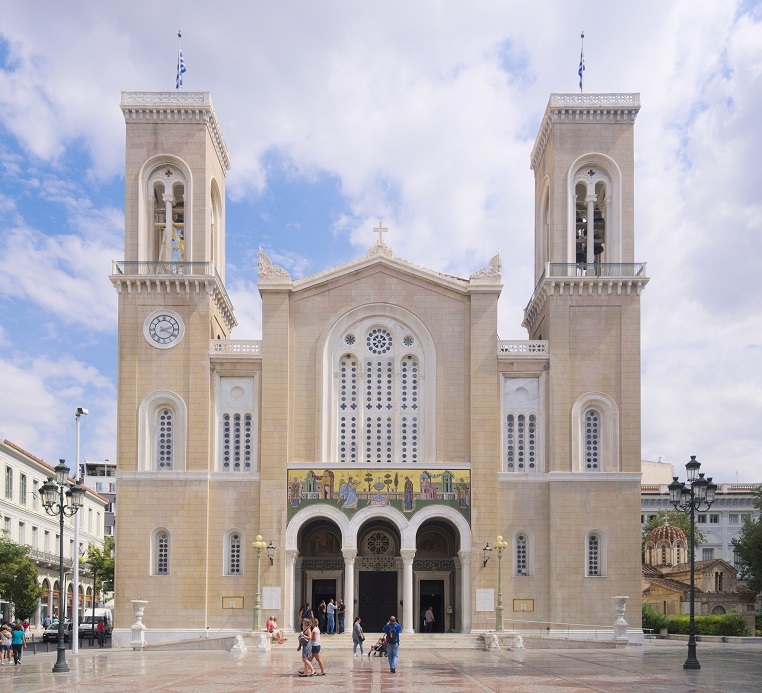 ‘Mitropoli’ is the Metropolitan Cathedral of the Greek Orthodox Church in Athens from 1862. The church is often the site of important ceremonies with national political figures present, as well as weddings and funerals of notable personalities. From 1999 until 2016 it underwent extensive reconstruction work. Being downtown, it’s easy to forget Athens is a coastal city. Really, you don’t need to take the ferry to a faraway island. 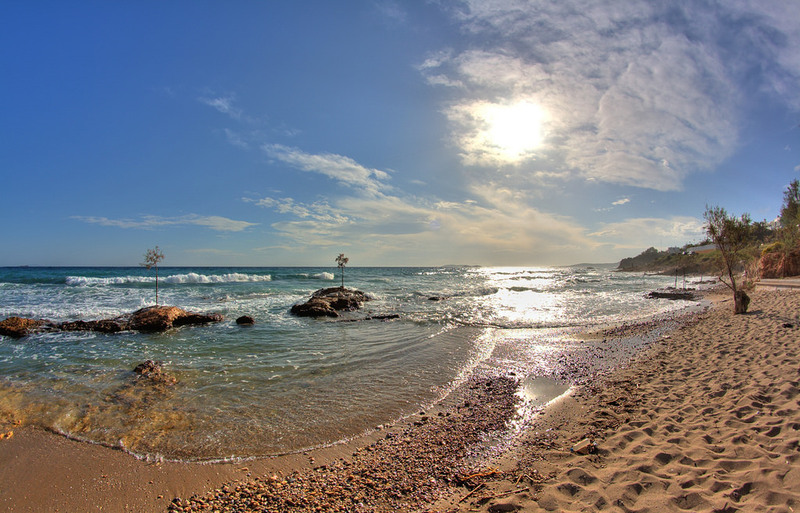 All it takes is a ride on a bus or a tram and you can visit the Athenian beach of your choice. As many have noticed, the further away you get, the better the beaches are. Take the Tram from Syntagma towards Voula. After about 30 minutes you will be on the coastal zone.